This regiment, attached temporarily to Col. Marsh's command, was engaged here at 10 A.M. April 7, 1860. Location. 35° 8.732′ N, 88° 20.7′ W. Marker is near Shiloh, Tennessee, in Hardin County. Marker can be reached from Cavalry Road 0.2 miles west of Sherman Road, on the left when traveling west. Touch for map. 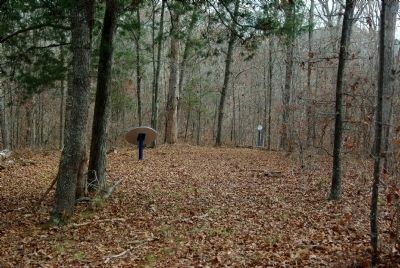 Located in Shiloh National Military Park, 150 yards south of Cavalry Road on a trail leading east from Jones Field into the woods. Marker is 75 yards from edge of field. Marker is in this post office area: Shiloh TN 38376, United States of America. Touch for directions. Back of marker as seen on trail looking east from Jones Field. in a direct line); Marsh's Brigade (about 400 feet away); Girardey's Georgia Battery (about 400 feet away); 4th Tennessee Infantry (about 500 feet away); 16th Iowa Infantry (about 500 feet away); McAllister's Battery (about 500 feet away). Touch for a list and map of all markers in Shiloh. More. 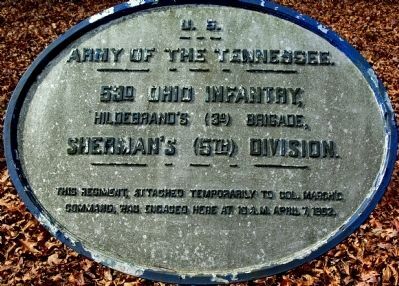 Search the internet for 53rd Ohio Infantry. Credits. This page was last revised on June 16, 2016. This page originally submitted on December 1, 2010, by Allen Gathman of Pocahontas, Missouri. This page has been viewed 402 times since then and 7 times this year. Photos: 1, 2. submitted on December 1, 2010, by Allen Gathman of Pocahontas, Missouri. • Craig Swain was the editor who published this page.